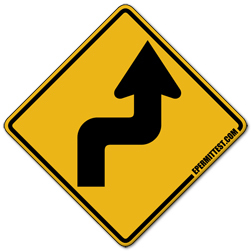 There is a series of sharp turns up ahead on the road. The road will first turn to the right and then to the left. The sign is frequently accompanied by a placard that indicates recommended speed for these turns. Slow down to negotiate sharp turns safely.